Various Artists – NEW 13 | Esc.rec. View the Creative Commons License (BY/NC/ND) that applies to this work. 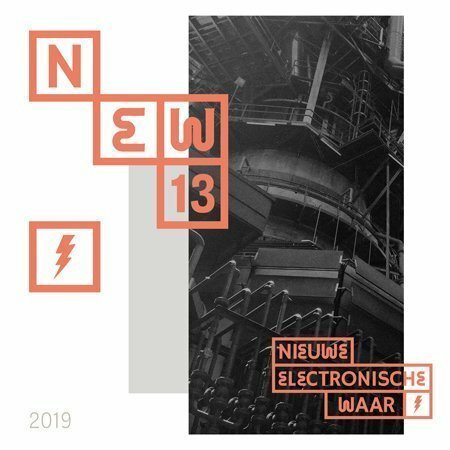 The 2019 selection for Nieuwe Electronische Waar 13, the most important talent development project for electronic music in the Eastern part of The Netherlands. A fine selection of ten of this year’s most promising new production talents will be coached in producing tracks, perfoming live and business matters concerning a career in music. Nieuwe Electronische Waar also releases a compilation album, proudly presenting the best new electronic music from the Dutch provinces of Overijssel and Gelderland. This year’s selection consists of Bastian Benjamin (Deventer), Lucinate (Nijmegen), (Deventer), mkk?.µ (Deventer), Frisceaux & Charlotte Schwartz (Arnhem), Zarbi Zibou (Deventer), Rajas Void Minus (Nijmegen), Hijmer (Nijmegen), NOPP (Deventer/Wageningen), fusus (Twello/Deventer) and Invisible Ralf (Nijmegen). All participants are offered a diverse, broad and personal development program, supported by partners and coaches from the Dutch dance music scene. The acts will be assisted in producing and finishing their tracks, mastering music and other technical challenges. Participants focusing on live performance are linked to bookers and/or managers. The Nieuwe Electronische Waar program also brings participants to network events such as Dance Fair, Muzikantendag, the Amsterdam Dance Event and other events. As part of Nieuw Electronische Waar, a compilation album is released including tracks by each of the ten participants. This compilation is available as a free download, on all relevant streaming channels and is promoted towards the international dance music industry. Nieuwe Electronische Waar is a joint project of music clubs Burgerweeshuis Deventer, Doornroosje Nijmegen and production company De Nieuwe Oost | pop, in cooperation with venues, festivals and associated partners from the Gelderland and Overijssel provinces, including Hedon Zwolle, Gigant Apeldoorn, Metropool Hengelo, Luxor Live Arnhem, Studio Wonder, Esc.rec., Wendbaar, ArtEZ conservatorium and MediaMusic, Extrapool Nijmegen, Booster Festival, De Perifeer Deventer, Koek FM, Valkhof Festival, 8Bahn, Green Vibrations, Deciliters, Metro Kollektief, 3voor12 Overijssel & 3voor12 Gelderland.